In brief, an injured Kenji gets taken to the Doctor’s office, where a lot of weirdos are in the waiting room. Kenji is taking a morning soak on a non-school day when the members of his club show up at his home along with Takao and Tama. After the group leaves Kenji’s house to get all the money from Tama’s people, Takao’s dress gets messed up. A replacement shirt gets messed up, as does the next replacement dress. When all is said and done, they have just enough money to buy an old console system, which turns out to be a fake. The group gets a real console system that ends up getting broken at school when Takao battles Funabori in a game. Kenji is then drafted to help bring Roka out of her funk as Takao brings cookies to apologize. Roka’s younger (and taller) sister Tsutsuji demands Kenji quit the Game Development Club (Temp). Kussie-senpai (Kusshi?) intervenes to stop a fight. Man, I just love this wacky manga! The first story only covers a single chapter and is basically an aftermath of the phone tag game from the previous volume. Still, we get to see Chitose’s older and sickly sister in action in the waiting room, handing out raw vegetables to everyone. Most of the other events in the waiting room are stupid but humorous, especially since Haruno-sensei loves to bring back ultra minor characters and give them speaking roles for comedic reasons. The second story has our main characters and central supporting characters (sans Funabori) all showing up at Kenji’s house for hilarity. This story covers two chapters and introduces us to Kenji’s and Noe’s ex-delinquent mother as well as Kenji’s childhood female friend Mogusa-chan. I have to say that this story had me laughing a lot. Roka and Takao keep calling Kenji’s mother using whatever Japanese term for mom. (I couldn’t find a raw to see exactly how they addressed her.) I’m guessing Kenji’s mom wanted to be addressed as Obasan. Chitose kept worrying about the Kazama’s messy yard, which kept making me laugh. They even got Kenji’s mom worrying about Kenji’s sexual orientation and whether he fancied Noe or not. 😆 Just nuts. The childhood friend moment is something Haruno-sensei raked over the coals by having Roka bag her and eventually Takao attack her. Those two are the main ones interested in Kenji, but the other girls all did their part, including Chitose digging a grave in the yard. 😆 Tama showing up just escalated things to the next level for me and I ended up laughing so much. Takao gets put on a figurative roller coaster with the ongoing gag of every outfit she wears getting messed up with food and drink stains. One can’t help but feel badly for Takao, though she does have her breaking point, as seen when the two younger girls that ruined one of her outfits got the evil eye from her and ended up helping buy her a nice dress. For the fourth story, we get two chapters devoted to it. It picks up shortly after the third story and the hijinks continue at warp speed. Both Takao and Funabori are lovable characters that are easily embarrassed, easily cry, and both have major feelings for Kenji. Chitose and Sakura using Funabori as a tray to carry snacks is just downright mean. So you can’t help but feel sorry for her. However, Takao’s distress at seeing Kenji going above and beyond in helping Funabori made me feel sorry for Takao as well. Speaking of Kussie-senpai, this story marks her introduction into the manga. English fan sites are calling her Kusshi, so I don’t know which is the more accurate romaji spelling for her name. For now, I’m just going to go with the official spelling. The fifth story only covers a single chapter and is the weakest of the lot. Even weak, it still provided amusement. The weakness comes from the silly game the Game Development Club (Temp) played as a means of bringing Roka out of her funk from the game console breaking. As with the legend of Amaterasu, the club’s ploy worked. The funniest moment in the chapter came from Roka lying down, using one of her bags, tied to a ribbon, as a grabbing device to snag Takao’s cookies from her, only to be accidentally foiled by Takao. The final story of the manga is another single chapter affair and introduces us to Roka’s little sister. The hilarity of this chapter comes from Tsutsuji being angry that Kenji at the “oneechan love” lunch that Tsutsuji prepared for Roka. Kussie and Barfie make humorous cameos as well. For the omake chapter, Haruno-sensei again returns us to the Takao household. (When is he going to give Takao a proper given name? Come to think about it, no one in the Takao family has a given name. 😆 ) Takao’s mom and two older sisters are a hoot as they discuss Takao’s interest in a certain thug boy (Kenji). There are two other omake manga items. First is Haruno-sensei’s page where he and his new editor “chat.” The other manga is a 2-page omake about Kussie. On the Seven Seas side of things, Japanese honorifics are heavily used, including brother and sister terms. I’m always going to be a fan of that. The writing has a more localized feel with Tama. When I attempted to look up some of the original Japanese elements to the manga volume, I did pick up that the adaptation can be somewhat liberal in its handling of the Japanese source material at times. For example, when Roka attacks Mogusa-chan, it is a parody moment for those shounen battle mangas. Roka uses a finishing technique called Sente Hitsushouken Seiken (or something like that), which can be translated as Preemptive Absolute Victory Constricting Fist. Seven Seas decided to not use a battle technique name, but instead opt for the wisdom of Sun Tzu ala Death Note. I’m really not a fan of these kind of pointless changes in favor of localization (vs. just adapting it into English with Japanese honorific usage). Because the manga is so good and funny, and because Seven Seas at least (mostly) respects the Japanese honorific usage, I end up giving these things more of a pass than I normally would. I still miss translator notes. Some of the jokes that were rewritten for the English audiences have some interesting elements on the Japanese side that would have been nice to have been noted. The only other extras are a preview of Non Non Biyori volume 1 and four color pages at the start of the manga. 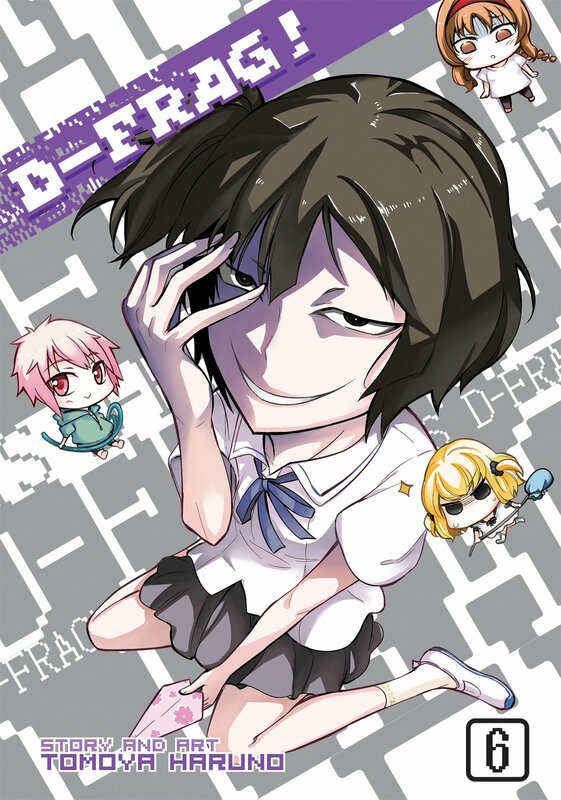 In the end, D-Frag! volume 06 continues to be the insane, wacky, unpredictable comedy manga that I have come to really enjoy. I highly recommend buying this manga if you like this kind of comedy.